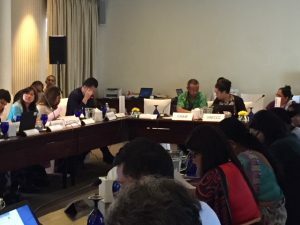 Representatives from 12 Asian and Pacific countries attended two workshops held in Colombo, Sri Lanka. One was the ecbi regional workshop aimed at training new and junior negotiators from developing countries so that they may participate more effectively in the UN climate negotiations. Organised in partnership with the local NGO Janathakshan, the sessions, many of them delivered by seasoned LDC negotiators, combined presentations on some key thematic areas of the Paris Agreement with practical exercises and tips to help equip participants for the negotiations. Through break out groups and mock negotiations, participants were encouraged to engage and exchange, and fully did so. 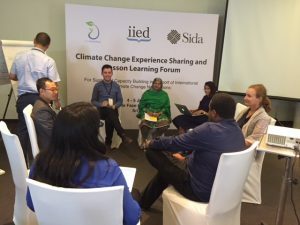 This was helped by them having had the opportunity to get acquainted with each other over the previous two days, during a climate change experience sharing and lesson learning forum, organised by IIED and Janathakshan, and a new addition to the ecbi regional training programme. The forum started with a field trip to share lessons and experience of a flood mitigation area and urban space development initiative near Colombo, and was followed by an informal forum in which participants were invited to talk about their country’s experience in planning for a low carbon resilient development, translating their priorities into implementable projects and programmes and accessing funds, as well as the institutional and capacity challenges they face in implementing their NDCs. LRI presented on tools available to law and policy makers responsible for developing and reviewing climate-related laws and plans, including the climate legislation portal it is currently developing. On Wednesday, 13 June 2018, an LRI publication on initial suggestions for developing legislative interventions on climate change through public consultations was officially launched in the National Assembly of Cameroon in Yaounde. 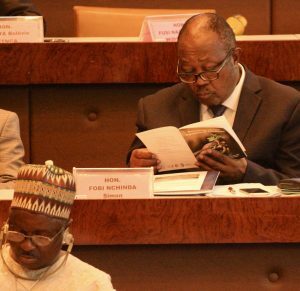 Following the Cameroonian equivalent of Prime Minister’s question time, the second item on Parliament’s agenda for the afternoon was the presentation of 2 publications: “Science, Economics and Politics of Climate Change” by the Konrad Adenauer Foundation and “Bottom-up climate legislation in Cameroon” by LRI. The LRI booklet can be downloaded at https://legalresponse.org/further-resources/briefing-papers/ The Cameroonian Minister of the Environment congratulated LRI and its partners on the publication and called it “important and timely guidance on how to contribute to the global fight against climate change”. He emphasised, in particular, the importance of participatory approaches in developing law and policy. In Cameroon – he stated – environmental and social impact assessments are, therefore, a legal requirement for many projects, plans and strategies. Augustine Njamnshi, a co-author of both publications, presented their main content and findings to around 50 MPs in the National Assembly. The event was organised by the Cameroonian Climate Change Working Group, a member of the Pan African Climate Justice Alliance (PACJA) and hosted by the MP Awudu Cyprian Mbaya who is also the executive chair of the Pan African Parliamentarian Network on Climate Change. LRI outstanding work and innovative model received a high accolade at the prestigious Law Society Excellence Awards that took place in October 2017. The law firm Simmons & Simmons, who has been one of our key supporters over the years – giving LRI office space for hosting the Situation Room and for its employees, and providing many hours of invaluable pro bono legal support – was nominated for an award in the pro bono category. We were delighted to be chosen by them as showcase for this work. Although not the winners, being finalists was in itself a recognition for their exceptional contribution to pro bono work, as was their selection as one of the Law Society video case studies celebrating excellence in law, which you can watch here.